To use my nursing degree to help those in need and to also use my Spanish knowledge to communicate with those from and in Spanish-speaking countries. Speaking their language in English-speaking hospitals often brings a level of comfort to patients. Studying abroad also makes me want to seriously consider traveling nursing upon graduation. I would love to see and work in other parts of the U.S. and even across the globe. I was certainly nervous at first. However, once I found other students at the airport, I calmed down a bit because we were all together in this entirely new experience. My excitement started to come out once I talked with other students and headed to the hotel. I soaked up the scenery of the foreign country in awe. I was extremely tired but I was intrigued to discover my new home. The excitement and newness of the city lasted the first half of my trip. The second half I was more comfortable in my new home, but still eager to learn and see as much as I could. What did you think about your study abroad program? Would you study abroad again? My program was absolutely incredible and better than I ever could have expected. It was truly a trip of a lifetime. Nearly all aspects of the trip (host family, friends, excursions, food) were really awesome and I loved experiencing life in another country. It has made me want to continue to travel, so yes, I hope to study abroad in an upcoming summer before I graduate. Memories I will never forget, some life-long friends, fluency in Spanish, and a new appreciation for other parts of the world, including those I have not seen and languages I do not speak. What advice would you give to other students thinking about studying abroad? I highly recommend studying abroad for anyone who may be considering it. It can be quite expensive, but there are countless scholarships out there to help reduce the cost. It may be stressful, but at the end of your trip you will look back and know that it was worth every moment of stress (and every penny). Go with an open mind. No matter where you go, it isn’t going to be your home. Cultures and people will be different, but it is such an eye opening experience to live in another world. Do anything you are able to do and be open to try anything new. If they offer museum visits or shows, go! It is a great way to learn about the culture. Usually, the program will pick out highlights of what to do in the city so they are typically enjoyable. Practice the language as much as possible! It helps you improve language skills and also allows you to interact with locals. 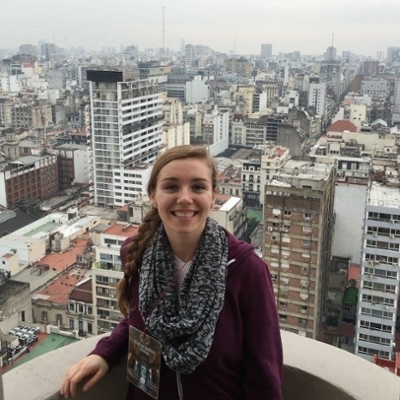 How did studying abroad impact your experience at IUPUI? It made me want to get more involved on campus and to volunteer. In Argentina, my program was able to interact with a poorer neighborhood. We worked to clean up a garden and to build another garden in a community center. With these gardens, the neighborhood would be able to enjoy the beauty and also have fresh produce. Doing these small acts, we were able to see what a huge impact it would make in the community. They were very grateful and I would like to be able to pass that happiness onto my own community.